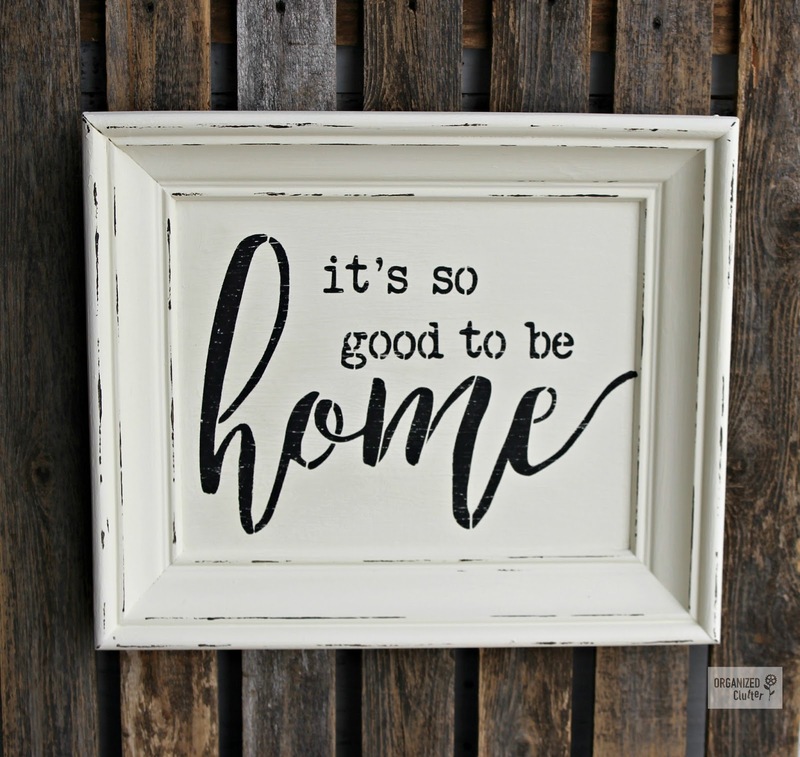 Besides creating great decor for your own home, you can create boutique style gifts for your friends and relatives too. Like this thrift shop snowman tray above! I paid $2.99 for it. It was mass produced, machine painted, and dated. I purchased this wall art mostly for the frame. I paid $1.00. Let's make them into boutique style gifts anyone would love to give or receive. For the tray, I first base coated the tray with Rust-Oleum Painters Touch Latex in Flat Black . I then brushed on two coats of Rustoleum Chalked Paint mixed in Vintage Ivory . For the picture, I used Zinsser Bulls Eye 1-2-3 Primer first, followed by two coats of Annie Sloan Chalk Paint in Old White right over the frame AND the print too. I purchased this stencil pack from Artminds at Michael's. The only problem with the Minnesota stencil was that it was too small for my tray. I placed the stencil on my scanner/printer, enlarged it, and printed it on card stock. Then I used an exacto knife to cut out my larger state paper stencil. It's not as sharp as a machine cut stencil, but it worked pretty well. I found a stencil on Etsy for $17.78 plus shipping. I am still saving money on my homemade boutique sign. Remember now, I will be using this stencil for my picture sign, another sign for my daughter, and I will sell the tray. I'm still way ahead of the one $68 boutique sign. 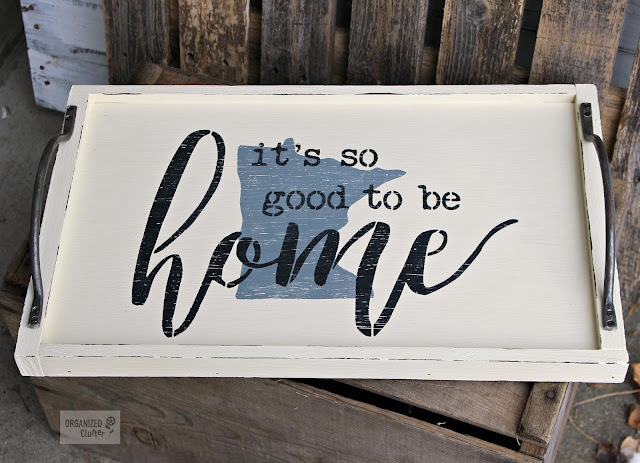 Minnesota was stenciled in Ceramcoat Acrylic Paint in Rain Grey and the lettering was stenciled with Ceramcoat Black. I used my FolkArt Layering Wood Block to faux distress the edges. More information about the layering block technique can be found here. I sealed the tray with two coats of Varathane Water-Based Poly, Satin Finish . 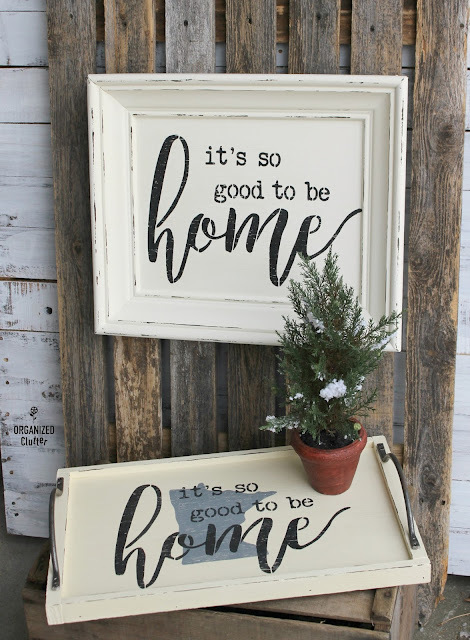 The lettering on the picture was also stenciled in black with faux distressed edges. I rubbed Minwax Paste Finishing Wax in Natural on with picture sign with a paper towel to protect and seal the paint and stencils. 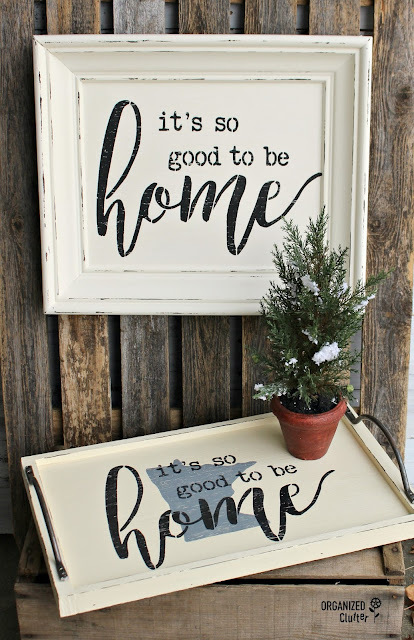 I COULD make signs and trays from scratch, out of wood, but if you shop thrift stores, you can save sawing and building time, trouble and mess, and go right to the painting and stenciling! I think it's called a cheater build. I am very happy with my project results. very cute! the only problem with a WYOMING stencil is that it's a boring rectangle! i'll have to choose the bronc cowboy or our buffalo state flag! but definitely want to try the HOME stencil you chose! Have you considered painting over the stencil lines, like close up the "o"s, "g"s and other letters that prove they were stenciled. If you do that, it would look more like hand lettering. It might improve the look. I actually prefer the stenciled look. Love it! I think you should consider asking Santa for a Cricut or Silhouette for Christmas and then you could cut your own stencils.